Tata Iron & Steel Company Ltd has posted a net profit of Rs 345.40 million for the quarter ended December 31, 2001 as compared to Rs 1,276.90 million in the corresponding period last fiscal, registering a fall of 72.95 per cent. Kenneth Lay, the embattled Chairman and Chief Executive Officer of Enron Corp, resigned from the bankrupt energy company but will remain on the company’s board. The Board of Directors of the Ludhiana Stock Exchange have expressed concern over SEBI’s instructions to the regional stock exchanges to demutualise, without ensuring adequate compensation to the brokers. 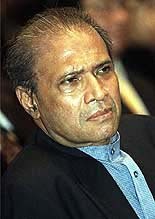 Malaysian businessman T. Ananda Krishnan is seen in this picture dated 2001. Forbes estimated Ananda's personal wealth at $1 billion. Locally, also known as AK, is one of the 10 richest men in Malaysia. Not bad for the son of a Ceylonese immigrant family born nearly 64 years ago in Brickfields, Kuala Lumpur's "Little India". The best of health care facilities at reasonable rates is what Apollo Health and Lifestyle, a subsidiary of the Apollo Group, which will shortly open eight Family Health Centres in Punjab and Chandigarh, promises. Business chambers today called for early introduction of Value Added Tax to give a competitive edge to Indian industry. Procurement of wheat during the rabi marketing season 2002-2003 is expected to touch 230 lakh tonnes. Income tax authorities today searched some premises of HCL group of companies for alleged bunglings of worth crores of rupees through transfer of shares to its Overseas Corporate Body in Mauritius. Spice Telecom today commissioned it’s new switch involving investment worth Rs 20 crore, at Jalandhar. Punjab National Bank registered a net profit of Rs 410.28 crore for the nine months ended December, 2001, thereby showing an increase of 20.13 per cent over the corresponding period last year. ICICI Limited announced a net profit of Rs 256 crore in the quarter ended December 31, 2001 registering as compared to Rs 253 crore in the same quarter last fiscal. Total income increased to Rs 16,946.20 million in the reporting quarter from Rs 16,434.50 million in the same period a year earlier, according to a company release. Tisco incurred an extraordinary expense of Rs 593.60 million towards the Employee Separation Compensation in the reporting quarter as compared to Rs 527 million in corresponding period last year towards the same expense. The company said lower margins were due to one of the worst periods for the steel industry due to a downturn in global and domestic economies and international trade restrictions. Gujarat Ambuja Cements Ltd has posted a net profit of Rs 571.60 million for the quarter ended December 31, 2001 as compared to Rs 325.50 million for the same period last fiscal. Net sales was higher at 17.39 per cent at Rs 3,500.80 million in q2 as compared to Rs 2,982.20 million in the quarter ended December 31, 2000. Aksh Optifibre Ltd, a leading player in the optic fibre manufacturing industry, increased its turnover by 59 per cent to Rs 49.76 crore during the third quarter of the current fiscal from Rs 31.24 crore in the corresponding period of the previous year. However, the company’s net profit dropped to Rs 1.39 crore from Rs 2.88 crore during the same period, the company announced today. Engineers India Ltd reported a net profit of Rs 114 million for the quarter ended December 31, 2001 as compared to Rs 396.20 million for the same period last year. Total income for the reporting quarter was at Rs 1,406.70 million as compared to Rs 2258.90 million for the corresponding quarter last year. VST Industries Ltd has posted a net profit of Rs 116.20 million for the quarter ended December 31, 2001 as compared to Rs 60.80 million for the same period last fiscal. Aftek Infosys Ltd has posted a net profit of Rs 80.67 million for the quarter ended December 31, 2001 as compared to Rs 39.56 million for the quarter ended December 31, 2000. Archies Greetings & Gifts Ltd has posted a net profit of Rs 3.52 crore for the quarter ended December 31, 2001 as compared to Rs 4.55 crore in the corresponding period last fiscal. Varun Shipping Company Ltd has reported a net profit of Rs 2.55 crore for the quarter ended December 2001 as compared to Rs 3.00 crore for the same period last year. Total income for the reporting quarter was at Rs 53.22 crore as compared to Rs 51.04 crore for the same quarter last year. Sesa Goa Ltd has posted a net profit of Rs 59.94 million for the current quarter ended December 31, 2001 as against Rs 108.61 million for the same period last fiscal. Tata Power Company Ltd has reported a net profit of Rs 108 crore for the quarter ended December 2001, up by 5.88 per cent from Rs 102 crore for the corresponding period last year. Net sales for the reporting quarter was at rs 930 crore as compared to Rs 887 crore for the quarter ended December 31, 2000. Tata Chemials today decided to buy back upto 10 per cent of its total paid up equity share capital through stock market operations at a maximum price of Rs 60 per share. Varun Shipping Company has reported a 14.95 per cent drop in its net profit to Rs 2.55 crore during the quarter ending December 31 compared to Rs 3 crore in the same period last fiscal. Colour Chem Ltd has posted a net profit of Rs 56 lakh for third quarter ended December 2001 compared to net loss of Rs 80 lakh for the same period last fiscal. Lay, 59, transformed Enron from a regional pipeline company into one of the world’s largest energy-trading firms. But more recently, he has been blamed for much of what went wrong at Enron. “I want to see Enron survive, and for that to happen we need someone at the helm who can focus 100 per cent of his efforts on reorganising the company and preserving value for our creditors and hard-working employees,” Lay said in a statement released last night by Enron. Lay said the many investigations into Enron’s activities take up too much of his time and make it difficult to concentrate fully on what is most important to Enron’s stakeholders. His resignation came the day before two congressional committee hearings related to Enron’s downfall were to begin. The Board of Directors of the Ludhiana Stock Exchange (LSE) have expressed concern over SEBI’s instructions to the regional stock exchanges to demutualise, without ensuring adequate compensation to the brokers. They have urged SEBI to provide a route to recompense the members, who have invested crores of rupees to build the exchange. Referring to the SEBI’s guidelines for the completion of demutualisation process by March 31, 2002, Mr Jaspal Singh, president, LSE, said,‘‘ We have grudgingly accepted the decision in principle. There are only two options before us either to close down the exchange or demutualise it — separation of administration and trading functions. It simply means that the members would have no control over the exchange.’’ Is it justified that the brokers, who have invested more than Rs 20 crore, including about Rs 5 crore for the computerisation and technical up-gradation, would have no control over the management. Should SEBI not prepare a road-map to compensate the members before asking for demutualisation, he asked. Admitting that the trading at the LSE and number of other regional exchanges had come to a naught for the past over one month, he claimed,‘‘ We have not officially closed down the exchange and are looking for a way out to reclaim the brokers’ money to the possible extent. Since ours is a mutualised exchange set up with mutual investment of members, without any share of the government or financial institutions, we should be either provided a role in the management, like any company or the value of our shares or compensation, he said. At its meeting held on January 19, the board considered a proposal to shift its role to a financial house, which could provide different services to the investors like liquidity and redressal of complaints, besides trading through LSE Securities Limited, its subsidiary. It has empowered the president to take up de-recognition and compensation issues with SEBI, in association with other stock exchanges. The brokers agreed that de-recognition would result in loss of listing fee given by listed companies, to the tune of Rs 1 crore annually, but there was no other option. Mr Tarvinder Dhingra, former vice-president of the exchange, pointed out that the consolidation of stock exchanges was a world-wide exercise. But some way must be worked out to safeguard the interests of the exchange. Mr Jaspal Singh suggested that SEBI should either merge the regional exchanges with the NSE or the BSE on the pattern of Australia to build one or two exchanges in the country or provide a chance to sold their shares in a time bound period after assessing the net asset value of the exchanges. The best of health care facilities at reasonable rates is what Apollo Health and Lifestyle (AHLL), a subsidiary of the Apollo Group, which will shortly open eight Family Health Centres in Punjab and Chandigarh, promises. To be called “The Apollo Clinic”, these franchised clinics will provide consultancy, diagnostic and pharmacy and preventive health check up packages — all facilities under one roof, said Mr Ratan Jalan, Chief Executive Officer, Apollo Health and Lifestyle, who was on an official visit to the city while talking to The Tribune here today. AHLL has decided to open as many as 250 such clinics across the country. The first phase will have 75 clinics in Gujarat, Tamil Nadu, Delhi and Punjab. The company decided to enter into Primary Health Care two years back, finding this sector in the country largely ignored, said Mr Jalan, adding that Apollo looks at it as a good business opportunity also. Each clinic will involve an investment of almost Rs 2 crore and will be funded on 1:1 debt equity. “Cash profits will start accruing in the first year and the project has a projected post tax IRR of nearly 30 per cent”, he said. While AHLL has finalised Trident as it’s franchisee for the clinic at Barnala, franchisees for other places — Chandigarh, Jalandhar, Amritsar, Patiala, and Ludhiana are yet to be finalised. The franchisees will be provided assistance by Apollo in mobilisation of financial resources, selection of an appropriate site, site architecture and selection and installation of medical equipment. AHLL will also assist the franchisee in sourcing and selection of medical equipment as well as IT infrastructure-(hardware and software) to deliver superior services to the customers. Apart from consultancy, diagnostic and pharmacy, these clinics will also offer value added services like complete disease management programmes, counselling and tele-medicine facilities that will enable patients to seek a second opinion from select experts located elsewhere in India, said Mr Jalan. Business chambers today called for early introduction of Value Added Tax (VAT) to give a competitive edge to Indian industry. PHD Chamber of Commerce and Industry sought a special Parliament session to amend the Central Sales Tax and other Acts for the timely implementation of VAT, the introduction of which was deferred by a year, till April 1 next year, yesterday. Amendments were required for transfer of power to tax AED items to states, transfer of service tax and compensation of revenue loss to states, PHDCCI President Arun Kapur said. Any further delay in introduction of VAT system will affect the competitiveness of the Indian industry at domestic as well as global level especially after removal of quantitative restrictions and reduction of customs duty, Mr Kapur added. Any delay beyond April 2002 would further hurt the Indian industry and may aggravate the existing slowdown in the economy to the detriment of the domestic industry. Expressing concern over the postponement of VAT, Assocham President K.K. Nohria said an early consensus to make a fully integrated national VAT a reality was imperative to avoid the cascading effect of taxes. Procurement of wheat during the rabi marketing season 2002-2003 is expected to touch 230 lakh tonnes. The total procurement of wheat as on December 10, 2001, during the last season was 206.3 lakh tonnes. The estimate emerged during a meeting of the food secretaries of various states with the Union Food Ministry officials. Food Secretaries of Punjab, Haryana, Bihar, Uttar Pradesh, Madhya Pradesh, Gujarat and Delhi participated in the meeting, besides senior officials from the Ministry of Agriculture and the Food Corporation of India. Official sources said the problem of plenty would further aggravate this year as against a buffer stock requirement (BSR) of 11.6 million tonnes of wheat, procurement this year alone was going to be twice that amount. According to the estimate, procurement during the coming rabi season will be 23 million tonnes, up from 20.6 million tonnes in the previous rabi season. The 23 million tonne procurement is against an output projection of over 70 million tonnes in the coming season and when combined with about 20 million tonnes of paddy procurement in the ongoing kharif it is likely to increase the foodstocks with the government to a new high of around 75 million tonnes. The government now has a surplus stock of more than 40 million tonnes over and above the BSR, which was 18.1 million tonnes, including 6.5 million tonnes of rice and 11.6 million tonnes of wheat. While the government stocks were to the tune of 58.2 million tonnes with 36.8 million tonnes of wheat and 21.4 million tonnes of rice. Income tax authorities today searched some premises of HCL group of companies for alleged bunglings of worth crores of rupees through transfer of shares to its Overseas Corporate Body (OCB) in Mauritius. The Mauritius route has been in the thick of controversy for alleged money laundering operations thriving on its being a tax haven. The shares, it is alleged, were transferred at a much lower price than their market value. Spice Telecom today commissioned it’s new switch involving investment worth Rs 20 crore, at Jalandhar. The switch which has a subscriber capacity of one lakh, will augment the current capacity of network and also ensure high reliability, better quality service and improved efficiency, said Mr Vinod Sawhney, MD, Spice in a press release today. The new switch in Jalandhar is an addition to the existing switch of Spice which has capacity of 3,00,000 subscribers. Jalandhar has the BSNL gateway exchange, which routes all calls from Punjab. “The commissioning of new switch would give Spice an additional advantage in ensuring higher uptime for the benefit of end users and better utilisation of resources”, said Mr Sawhney. Punjab National Bank (PNB) registered a net profit of Rs 410.28 crore for the nine months ended December, 2001, thereby showing an increase of 20.13 per cent over the corresponding period last year. Mr S S Kohli, Chairman and Managing Director stated in a press release that the bank attained this level of profits after providing for necessary provisions of Rs 560.06 crore towards loan losses, depreciation on investment and fixed assets, standard advances etc. While gross profit for this period showed an increase of 36.9 per cent, the total income increased from Rs 4,772 crore last year to Rs 5,697 crore (19.4 per cent increase). The interest income of the bank increased by 16.4 per cent over the corresponding period of last year and non-interest income registered 43.4 per cent growth. The bank is promoting the use of Krishi Cards and against the target of 3.26 lakh Krishi Cards for the year 2001-02, PNB has already issued 3.22 lakh cards till December end. The ICICI board of directors at its meeting held here today approved the audited accounts of the company for the nine months ended December 31, 2001 and an interim dividend of 55 per cent (Rs 5.5 per share-excluding dividend tax) in respect of the financial year ending March 2002). The board fixed February 16 as the record date for the interim dividend payment, an ICICI release said. The Oriental Bank of Commerce (OBC) today announced a 63 per cent increase in its net profit for the nine-month period ended December 2001. The net profit after making the provisions works out to Rs 257 crore against Rs 158 crore in the corresponding period of last year. HDFC today signed a joint venture agreement with US-based Chubb Corporation for non-life insurance business, in a bid to tap $ 2.2 billion worth market in India.